Tessel CADRaster предоставляет инструменты для продуктивного использования отсканированных чертежей и других растровых изображений в AutoCAD и FelixCAD. Это дает возможность этим программам для отображения монохромных, полутоновых и цветных растровых изображений. Отсканированный растр отображаются на рабочем столе CAD-систем совместно с векторными рисунками и обрабатывается точно также с помощью инструментов интегрированных в САПР. Т.е. растровые и векторные данные сосуществуют в одной и той же системе координат, так что операции, такие как масштабирование, панорамирование и т.п. им доступны одинаково. Программа для работы с растром в среде AutoCAD. CADRaster provides tools for productive utilization of scanned drawings and other raster images in AutoCAD. It enables these programs to display monochrome, gray-scale and color raster images. The scanned drawings and pictures are shown on the AutoCAD screen together with vector drawings (DWG) and processed using tools integrated with CAD application's commands. Raster and vector data coexist in the AutoCAD session and are well defined in the same coordinate system, so that operations like zooming, panning and matching of raster images and vector drawings may be done easily and precisely. CADRaster provides tools for productive utilization of scanned drawings and other raster images in AutoCAD and FelixCAD. It enables these programs to display monochrome, gray-scale and color raster images. The scanned drawings and pictures are shown on the AutoCAD/FelixCAD screen together with vector drawings (DWG/FLX) and processed using tools integrated with CAD application's commands. Raster and vector data coexist in the AutoCAD/FelixCAD session and are well defined in the same coordinate system, so that operations like zooming, panning and matching of raster images and vector drawings may be done easily and precisely. CADRaster is an excellent tool to correct any defect introduced by source material or scanning process. After that, you can use scanned images as background to new designs, vectorize image contents or modify image to bring the document up to date. First CADRaster version working with AutoCAD Rel. 10 was introduced on the market in 1990. CADRaster has been awarded in different countries, the most prestigious award being CADENCE Editor's Choice Award '96 for CADRaster LT.
CADRaster is available in two versions: LTX and PRO. LTX version offers limited functionality. 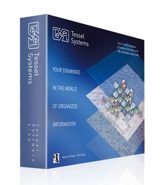 Both products run across all AutoCAD versions from LT2005 to 2008 and are available in the following language versions: English, German, Polish and Czech. Since the 4.60 release two new language versions are available: Japanese and Finnish. 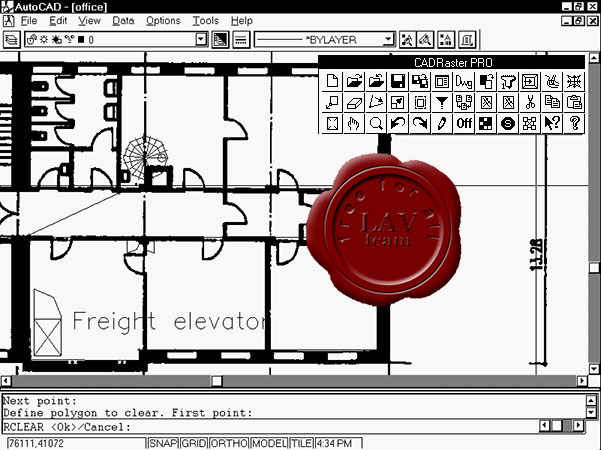 CADRaster for FelixCAD is offered since the 4.61 version. For now it is available in English, German, Japanese, Polish, Czech, Finnish and French language versions. CADRaster PRO 9.0 - raster tools for AutoCAD LT2006, LT2007, LT2008, 2006, 2007, 2008 or 2009. Программа для работы с растром в среде AutoCAD и FelixCAD.